A Nwaopara, C Anibeze, F Akpuaka, E Uhumuavbi. 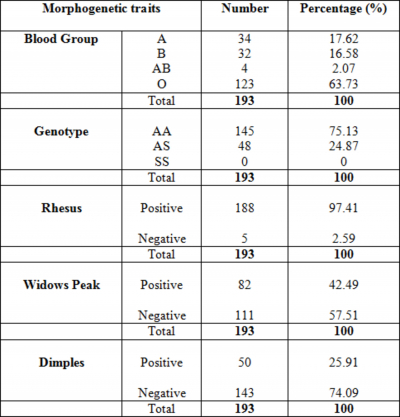 The Pattern of Morphogenetic Traits Combination amongst the population of Ekpoma, Nigeria: Focus on Dimples, Widows Peak, Blood groups and Genotypes. The Internet Journal of Biological Anthropology. 2008 Volume 3 Number 2. Variations exist in the pattern by which blood types (ABO and Rh) and genotypes (AA, AS and SS) are inherited. Similar variations exist in the expression of genetic traits like dimples and widows peak. In this study however, we are concerned with the growing sense in genetic epidemiology that many findings are failing to replicate as many of the claimed associations are false positive and these false positives are seen because of the inability to study many genetic variants in relation to many disease outcomes, without knowing the precise bio-cultural background of the groups being studied. Thus, we present a preliminary attempt to determine the combination patterns between some morphogenetic traits expressed by 193 residents of Ekpoma, Nigeria. Focus is on dimples, widows peak, blood groups and genotypes. The results showed that the distribution of blood groups and genotypes are in line with previous finding while the results on morphogenetic trait combinations strikingly suggests that certain combinations might be rare or non-existent. We believe that this and similar findings may one day play a role in ‘predictive human screening’. Anatomically, ‘widows peak’ refers to the descending V-shaped point at the middle of the head’s hairline just above the forehead of some individuals, while ‘cheek dimples’ are the small depressions that lie on the cheeks of some individuals especially when they smile. Genetically, both are dominant traits and those who do not express them are said to possess the recessive genes 1 , 2 . It is believed is that the presence of double or bifid zygomaticus major muscle may explain the formation of cheek dimples 2 . Another genetic phenomenon that has attracted several scientific enquiries includes the variations in the pattern by which genotypes (AA or AS or SS) and blood groups (A, B, AB, O, Rh + and Rh - ) are inherited. Interestingly, the ABO and Rh blood groups are among the most important blood group systems 3 and the pioneering work of Karl Landsteiner in 1900, served as the beginning of blood banking and transfusion medicine 4 . Even after 100 years, the single most important test performed in blood banking services is the determination of ABO blood groups to avoid morbidity and mortality 5 . Indeed, population diversity provides a unique opportunity to study the morphogenetic variations amongst endogamous populations living in different geographical and ecological conditions 6 . Available evidence has shown that marked inter-individual variability in genetic and non-genetic factors possesses the ability to influence the disposition of many endobiotics and xenobiotics affecting health 7 . Although the efforts to identify key genes influencing multifactoral complex phenotypes continue to be less than satisfactory 8 , 9 , scientists however, are beginning to understand how genes interact with each other and with environmental factors in ways that impact on health 10 . In fact, the scientific basis for this study is the growing sense in genetic epidemiology that many findings are failing to replicate, because many of the claimed associations are false positive and these false positives are seen because of our inability to study many genetic variants in relation to many disease outcomes 11 , 12 without knowing the precise bio-cultural background of the groups being studied. This study therefore, is one in the series of several preliminary attempts to determine the possible combination patterns that exists between expressed morphogenetic traits amongst the population of Ekpoma, Edo State, Nigeria. Our focus in this case however, is on the ABO blood groups, Rh factor, Widows Peak, and Dimples. This study was carried out in Ekpoma, the administrative headquarters of Esan West Local Government area of Edo State, Nigeria, and the host community of Ambrose Alli University, Ekpoma. Geographically, Ekpoma is bounded on the South by Igueben Local government area; on the Northwest and North East, by Owan East and Etsako West local government areas respectively; on the West, by Uhunmwode local government area; and on the East, by Esan Central local government area. The indigenes of Ekpoma speak Esan language and are predominantly farmers. However, the study population comprised of one hundred and ninety three men and women (193) who were randomly selected amongst the residents of Ekpoma. Relying on informed consent, blood samples were collected from each of the subjects via veni-puncture by the use of disposable syringes. The blood samples were stored temporarily in refrigerated heparanised containers pending when laboratory determination of genotype and blood group types would commence. However, the Dimple and Widow’s peak status of the subjects were determined by physical examination. Laboratory analysis of blood samples was done at Blossom Medical Laboratory, Uromi, Edo State, Nigeria. The materials used include cellulose filter paper, distilled water, clean white tile, cotton wool, hand gloves, sterile rod, an electrophoresis machine and Tank, Tris buffer, normal saline, applicator stick, test tube, bucket centrifuge, AS/AA controls, and a pencil. For the genotype test, cells were washed 2 to 3 times in a test tube containing normal saline after which, a drop of the washed cells was placed on a tile. This is followed by the haemolysis of blood on the tile and the placement of genotypes AS and AA controls on a cellulose acetate paper using an applicator stick. After making sure that the Tris buffer inside the electophoresis tank covered the electrode, the cellulose acetate paper was placed in the tank, which is then covered and the mains (current) switched on. Reading was taken and recorded after 5 – 10 minutes. For the blood group and rhesus (Rh) test, the tile technique was used. This was done by preparing a 10% cell suspension followed by the addition of one volume of cells and sera. This was then mixed well and the tile rocked by a wooden stick rocker. After 5 minutes, the reading was taken and recorded. The distribution of morphogenetic traits amongst the study population showed that a higher percentage of the population (123; 63.73%) had the blood type O, while the numerical value for those with blood type A, B and AB, were 34 (17.62%), 32 (16.58%) and 4 (2.07%) respectively (see table 1). Deductively, blood type AB was the least while blood type A and B numerically followed blood type O respectively. Also, a higher percentage of the study population (188; 97.41%) was rhesus positive while a lower percentage (5; 2.59%) was rhesus negative (see table 1). Similarly, a higher percentage of the study population (145; 75.13%) had the genotype AA while the rest of the study population (48; 24.87%) had genotype AS. None however, had the genotype SS (see table 1). On the distribution of the study population with or without widow’s peak and dimples, we observed that a higher percentage of the study population (111; 57.51%) did not present the widow’s peak trait while a lower percentage of the population (82; 42.49%) did (see table 1). Similarly, a higher percentage of the population (143; 74.09%) did not present the dimple’s trait while a lower percentage of the population (50; 25.91%) did (see table 1). On the possible morphogenetic traits combination pattern, the study population were subdivided into different classes: (i) Presence of Dimples (DP) and Widow’s peak (WPP) with either genotype AA or AS and with either blood types A, B, AB and O respectively; (ii) Presence of Dimples (DP) and absence of Widow’s peak (wpnp) with either genotype AA or AS and with either blood type A, B, AB and O respectively; (iii) Absence of dimples (dnp) and presence of Widow’s peak (WPP) with either genotype AA or AS and with either blood type A, B, AB and O respectively; and (iv) Absence of Dimples (dnp) and Widow’s peak (wpnp) with either genotype AA or AS and with either blood type A, B, AB and O respectively (see table 2). Based on the above, we observed that individuals in the class with AA + DP + WPP + Rh + , were more of those with blood type O (11) while those with blood type A and B were numerically equal (3). No one in this class had the AB blood type (see table 2). Also, the class with AA + DP + WPP + Rh - was non-existent irrespective of the blood type (A, B, AB, and O) (see table 2). Individuals in the class with AA + dnp + WPP + Rh + were more of those with blood type O (27) while those with blood types B (8), A (5), and AB (3) followed in that order respectively. Only an individual with blood type A and two (2) individuals with blood type O were in the class with AA + dnp + WPP + Rh - . Interestingly, none of the individuals with blood types B and AB belonged to the class with AA + dnp + WPP + Rh - (see table 2) (see table 2). Those in the class with AA + DP + wpnp + Rh + were more of those with blood type O (17) while those with blood type A and B were in number (1). Once again, no one in this class had blood type AB. Except for an individual with the blood type O (1) in the class with AA+DP+wpnp+Rh - , none with blood types A, B, and AB, belonged to the class (see table 2). The class with AA + dnp + wpnp + Rh + were well represented in the population particularly amongst those with blood type A (12), B (14), and O (34). 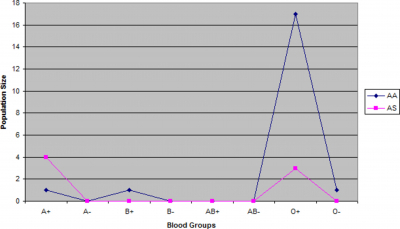 However, only an individual (1) with blood type AB was represented in the class. 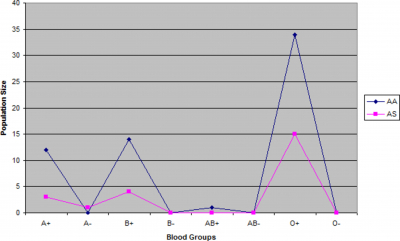 Obviously, the highest population in this class was recorded amongst individuals with blood type O (see table 2). Another important observation is the non-existence of individuals with blood types B, AB, and O, in the class with AA + dnp + wpnp + Rh - (see table 2). However, only an individual (1) represented those with blood type A in this class. Individuals with AS + DP + WPP + Rh + were more of those with blood type O (6) while only an individual (1) with blood type A, was recorded for this class. No one with blood types B and AB was recorded for this class. 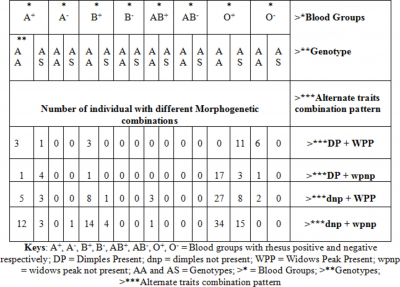 Similarly, the class with AS + DP + WPP + Rh - was non-existent irrespective of the blood groups (A, B, AB, and O) (see table 2). Individuals with the combination AS + dnp + WPP + Rh + were more of those with blood type O (8) while three individuals (3) had blood type A and an individual (1) had blood type B. In this class, none had the blood type AB. Similarly, no individual was registered for the class with AA + dnp + WPP + Rh - , irrespective of the blood type (A, B, AB, and O) (see table 2). Individuals with blood type A (4) and blood type O (3) were registered for the class with AS + DP + wpnp + Rh + . None in this class however, had the blood type B or AB. Again there was the non existence of the class with AS + DP + wpnp + Rh - irrespective of the blood type (A, B, AB, and O) (see table 2). Except for those with blood type AB, the class with AS + dnp + wpnp + Rh + , were represented by those with blood type A (3), B (4) and O (15). On the other hand, only an individual (1) with blood group A, was registered for the class with AS + dmp + wpnp + Rh - while none with blood types B, AB or O, was registered (see table 2). Finally, the highest population of individuals with blood types B + (14) and O + (34) were registered for the class with AA + dnp + wpnp + Rh + irrespective of the genotype (see figures 1 - 4). 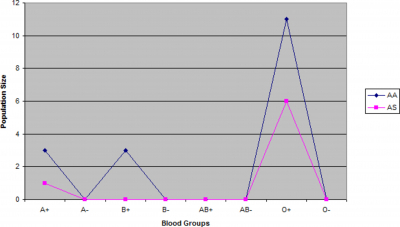 Only those with blood type A + were represented in all the classes irrespective of their genotype (see figures 1 - 4). Figure 1: Individuals with different blood groups and genotype but with the same morphogenetic traits combination (DP + WPP). Figure 2: Individuals with different blood groups and genotype but with the same morphogenetic traits combination (DP + wpnp). Figure 4: Individuals with different blood groups and genotype but with the same morphogenetic traits combination (dnp + wpnp). The findings of this study is in line with the reports by Adeyemo and Soboyejo 13 that the frequency of blood type O was the highest amongst students at the University of Lagos, Nigeria, followed by blood types A and then B, with the least being those with blood type AB. Similar proportions were recorded in Oyo state, Nigeria, by Bakare et al. 14 and interestingly, Shandilya 15 identified blood group O + as the most common blood type. The results on the distribution of the population based on genotype were also in line with the reports by Nwanfor and Banigo 16 (as cited by Adeyemo and Soboyejo 13 ). Recall that our results indicated that a higher percentage of the population (145; 75.13%) had genotype AA while the rest of the population (48; 24.87%) had the genotype AS. None however, had the genotype SS (Table 1). One other aspect of this study was the attempt to classify the study population based on the possible combinations of blood types (A, B, AB, O, Rh+ and Rh-) with genotype, presence or absence of widows peak and the presence or absence of dimples. From the results, it was observed that amongst the study population with genotype AA, those with the traits combination AA + dnp + wpnp + Rh + + O were the highest while those with DP + WPP + Rh + + O were the least. Similarly, those with genotype AS, and within the class with dnp + wpnp + Rh + + O were observed to be the highest while the least were those with DP + wpnp + Rh + + O. The result showed also that irrespective of the genotype (AA or AS), individuals with dnp + wpnp + Rh + + O and blood type O were the highest, suggesting that most of the population belonged to that class. On the other hand, only individuals with genotype AA and within the class dnp + WPP + Rh + + AB and class dnp + wpnp + Rh + + AB were registered, while none with genotype AS in both classes, was registered. In comparative terms (though still subject to further studies), carriers of the sickle cell trait may rarely present any of these traits combinations (dnp + WPP + Rh + + AB and dnp + wpnp + Rh + + AB). Judging by the instances where no individual was registered for some of the classes, one could simply say that our results suggested that certain morphogenetic traits combinations might be rare and that their existence as well, might also be a rare possibility. Although it might appear like an ambitious projection, we believe however, that the results from this kind of study may one day play an important role in ‘predictive human screening’ for clinical purposes. For example, the preliminary screening for emergency blood donation and transfusion. Moreover, as the distribution of morphological, genetical and behavioural traits amongst the people of Indian region has been compiled 17 , the findings of this study therefore serve as one such contribution about a Nigerian population. We are indeed grateful to Mr. Agbontain Osazee and Mrs. Ekpen Ogudo for their assistance during sample collections. 1. Widows Peak in Wikipedia the free encyclopedia. Assessed on 27th March, 2007 from http://en.wikipedia.org/wiki/Dimple#column-one. 2. Dimples in Wikipedia, the free Encyclopedia. Assessed on 27th March, 2007 from http://en.wikipedia.org/wiki/Widow's_peak#column-one. 3. Seeley RR, Stephens TD, Tate P. Anatomy and Physiology. 4th edition. The McGraw Hill Companies, Inc. USA, 1998. p. 1098. 4. Ali N, Anwar M, Bhalti FA, Nadeem M, Nadeem A, Ali M. Frequency of ABO and Rh blood groups in major ethnic groups and casts of Pakistan. Pak J Med Sci 2005; 21:26 – 29. 5. Honig CL, Bore JR. Transfusion associated fatalities: a review of Bureau of Biologic reports 1976 – 1978. Transfusion 1980; 20:653 – 661. 6. Bhasin MK, Khanna A. Study o f behavioural traits among nine population groups of Jammu and Kashmir. J Human Ecol 1994: 5: 131 - 134. 7. Lamba JK, Lin YS, Thummel K, Daly A, Watkins PB, Strom S, Zhang J, Schuetz EG. Common allelic variants of cytochrome P4503A4 and their prevalence in different populations. Pharmacogenetics 2002; 12: 121–32. 8. Inoue K, Lupski JR. Genetics and genomics of behavioral and psychiatric disorders. Curr Opin Genet Dev 2003; 13: 303–9. 9. Van de Bree MB, Owen MJ. The future of psychiatric genetics. Ann Med 2003; 35: 122–34. 10. Xu J, Meyers DA, Ober C, Blumenthal MN, Mellen B, Barnes KC, King RA, Lester LA, Howard TD, Solway J, Langefeld CD, Beaty TH, Rich SS, Bleecker ER, Cox NJ. Collaborative Study on the Genetics of Asthma. Genomewide screen and identification of gene-gene interactions for asthma-susceptibility loci in three U.S. populations: collaborative study on the genetics of asthma. Am J Hum Genet 2001; 68: 1437–46. 11. Cardon LR, Bell JI. Association study designs for complex diseases. Nat Rev Genet 2001; 2: 91–9. 12. Colhoun HM, McKeigue PM and Davey Smith G. Problems of reporting genetic associations with complex outcomes. Lancet 2003; 361: 865–72. 13. Adeyemo OA, Soboyejo OB. Frequency of distribution 0f ABO, RH blood groups and blood genotypes among the cell biology and genetics students of University of Lagos, Nigeria. Afr J Biotech 2006; 5 (22): 2062-2065. 14. Bakare AA, Azeez MA, Agbolade JO. Gene frequencies of ABO frequencies of ABO and rhesus blood groups and haemoglobin variants in Ogbomoso, south-west Nigeria. Afr J Biotechnol 2006; 5(3): 224 –229. 15. Shandilya R. Rare Blood Types. Assessed on 20th March, 2008 from Buzzle.com http://www.buzzle.com/authors.asp?author=12177. 16. Nwafor A, Banigo BM. A comparison of measured and predicted state. Nig. J Appl Sci Environ Mangt 2001; 5(1): 79 – 81. 17. Bhasin MK, Walter H, Danker-Hopfe H. The Distribution of Genetical, Morphological and Behavioural Traits among the People of Indian Region. Kamla-Raj Enterprises, Delhi, 1992. Department of Anatomy, Ambrose Alli University Ekpoma, Edo State, Nigeria. Department of Physiology, Ambrose Alli University Ekpoma, Edo State, Nigeria.